By Abrar Chaudhury and Chase Sova. Adaptation fund distribution is falling short, but the climate system in northern Ghana isn't waiting. Farmers are taking action in to their own hands while policymakers and development practitioners attempt to bridge the gap between funding sources and vulnerable communities. Over 12,500 km separate Lawra from Incheon. One is a small dusty farming town in Upper West Ghana, the other, a modern metropolis and the third largest city in South Korea. While the two cities are geographically, economically and culturally poles apart, they share a deep link: Incheon is the planned home of the Green Climate Fund (GCF). Decisions made there will determine global climate funding allocations, which in turn may impact how much funding climate-sensitive farmers in Lawra actually receive. Between the two cities, there also lies a complex web of international, regional, national and local actors operating on the adaptation agenda. With their conflicting internal priorities, competing interests and high rivalry for limited funding allocations, these actors inadvertently add additional layers of procedural and bureaucratic process, increasing the virtual distance between the funders and the fundees. On the bright side, there are increasing efforts by both policy makers and GCF project designers to cut out these layers of operational complexity by promoting direct access of funding to national implementation agencies. Though encouraging as it may be, the reality is that the fund faces a huge funding gap. Success of the fund is as much dependent on minimizing transactions costs through direct and easy funding access, as it is on the actual funding channeled through the GCF. According to latest estimates from Climate Fund Update, barely a fraction of estimated adaptation costs have so far been disbursed (see figure below). And this huge gap between the demand and availability of funding is only projected to widen as the effects of climate change increase and demands from developing countries grow. Meanwhile, commitments from donors are expected to slow in the face of a global economic downturn. This lack of ambition from world leaders to commit funding for climate change was recently reconfirmed once again in public debate. So what does this all mean for the climate-vulnerable farmers in Lawra Jirapa, Ghana? To start with, global climate funding will be hard to access, at least for the near future. The national funding position in Ghana is also not very encouraging. With huge development funding gaps supported largely through overseas development assistance climate related investments sit low on the priority list for local district budgets that focus on immediate development assistance. An alternative option would be to generate local revenue, but this requires up-front public investments that are just not available, creating a vicious funding trap that is seriously inhibiting funding flows to local farmers in Lawra. Despite such the grim funding situation, all is not bad. With limited outside assistance or domestic support, farmers in Lawra are innovating and drawing on resources from their local surroundings and communities. In a survey carried out by the CGIAR Research Program on Climate Change, Agriculture and Food Security (CCAFS) and Oxford University, researchers in the Systemic Integrated Adaptation program found all 30 of the small-scale subsistence farming families who were interviewed to be part of a community self help group. When not able to access tractors for plowing (only 2 tractors were available in Lawra last season), farmers resorted to block farming by plowing each other’s land in turn. 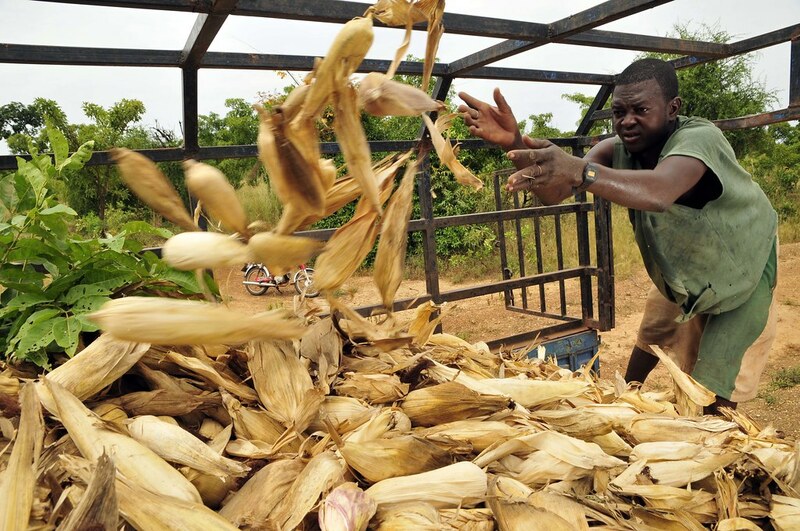 Farmers also developed multiple sources of income to counter the risks of rain variability. With increasing rain variability, the needs of farmers are also increasingly immediate. Amongst the farmers we spoke to, there was increasing recognition that there must be limits to how long they will wait for support; sometimes they will have to take the first step and seek assistance later. The window of opportunity is small, if the rains come and they are still waiting, there may be no food on the table - important planning insights for national policy makers. The physical distance between Lawra and Incheon will never shrink. But by taking it upon themselves to act, farmers - those most vulnerable and least financially capable - are attending to a funding reality that seems to be otherwise lost in translation. This blog originally appeared on the CCAFS website. This blog does not necessarily reflect the views of CCAFS, but is primarily an opinion piece by our researchers.